PBRSD is a volunter run non profit org. We are divoted to helping pits obtain a positive image through education. We advocate spay/neutering. All of our dogs come from shelters. All are temperment tested and foster home placed so that we know as much about them as possible before they go to their forever home. 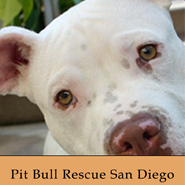 ADOPT ~ FOSTER ~ VOLUNTEER… ALL OVER SAN DIEGO COUNTY.